This has been a good year for both of us. Then a sad one as Buffy pass away and the lost was profound. We got married after 42 years being together and so happy that I was still around to see this. This is complete for me.No!it is not over till I say so LOL. Visit my family in Sturbridge Ma,as they surprised us with a wonderful dinner and most of my family were there to congratulated us. We spend a lot of time in the Summer going to the ocean that we love. Mike adopted Ruby a A mixed Manchester Terrier and then some. Ruby is coming along with me and not fully. Have not been able to take her out on the leash yet as we are working on this. Christmas Day will be a lonely one for us. My daughter will be going over to her children family. This will be the first time over so many years that she will not be with us. I truly understand this and why not they want her there. I will or we will be taking my daughter and grandchild along with great grandchild to lunch tomorrow as we are looking forward to it. Yes,it has been a wonderful year,being healthy and still able to play tennis at my age and this is a plus for me. What will the New Year bring? who knows and the challenge will be there for us to find out. Mike is very happy working with the animals and homeless population. He does most of the work around here and do a damn good job in taking care of me. My surgery is coming along fine and the healing is doing great. I played tennis Friday and felt so good to be able to do this. Missed it terribly when I was disable for two weeks. I want to express all of my friends here a "Merry Christmas"
Take care and look out for each other. The three of us will be thinking of you on this special day. Okay,2014 we are waiting for you. Take care,we love you all. Happy hear the year was a good one for you -- but the loss of any pet is a sad memory in any year. I lost not only my sister, but one of my kitties. I feel a bit sad as we enter the New Year but have hopes that I can heal. I wish the same for everyone with loss. Thanks for holiday wishes. The same to you and Mike. Enjoy your family. 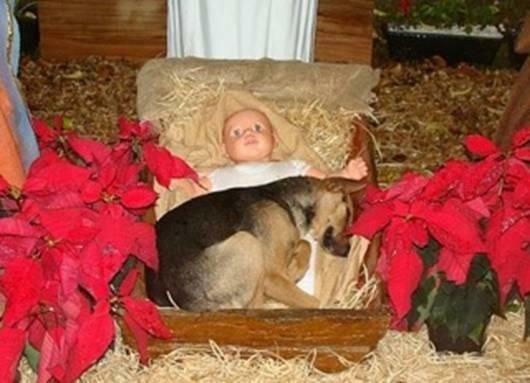 The dog in the manger is adorable! Glad you had a good year. Best holiday wishes to you and Mike, Fredo. Unless you have a baby in 2014 it can't/won't get any better than 2013--just hoping your health keeps up! !